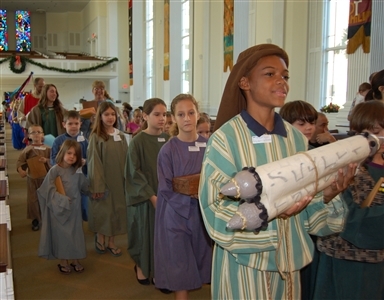 Children at First UMC, Orlando, participate in "A Walk Through Bethlehem," a 27-year tradition at the church. Photo by Pam Corwin. Hundreds of volunteers at United Methodist churches across the Florida Conference come together at this time of year to share and rejoice in the miracle of the birth of Jesus Christ. Amid the bustle of shopping and get-togethers, congregations invite people to pause and reflect while visiting living nativity scenes and faithful re-creations of that night in Bethlehem when Mary and Joseph found shelter in a stable. For Hope UMC in Trinity, First UMC and Spring of Life in Orlando, North Naples UMC, and Killearn UMC, Tallahassee, it also is a time of outreach for churches as thousands of people are drawn to the Christmas celebrations. The Hope congregation has been holding "Experience Bethlehem" for about a dozen years. Over four nights, from Dec. 6-9, more than 6,000 people walked the "streets" of Bethlehem, taking in the sights and sounds of a Jewish city before arriving at the manger and the baby Jesus. Hundreds of volunteers pitched in to make the event happen. Some spent several Saturdays building the city; others helped with the props. 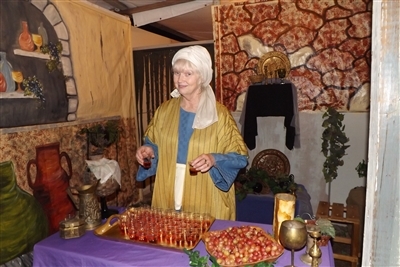 And each night about 300 church members donned period-style clothes and brought to life the story of Jesus' birth. Pastor Kelly Smith, dressed as the prophet Isaiah, typically is the first biblical figure to greet visitors as they enter the city. Visitors then stroll past shops as dancers and musicians entertain and Roman soldiers stand watch. There also is a temple and a Jewish family. As in past years, the Magi, or three kings, were expected to be a big hit with children, Smith said before the event. "Lots of children would run back into the city to the kings to tell them they'd seen the baby," he said. An infant in the manger is part of Hope UMC's re-enactment of the birth of Jesus in "Experience Bethlehem." Photos by Debbie Parker. Hope UMC's annual "Experience Bethlehem" outreach includes a wine vendor, along with other shops that make up a marketplace. 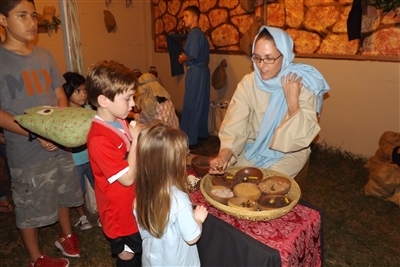 Children at Hope UMC's Bethlehem re-enactment check out the spice shop during the congregation's four-day annual Christmas outreach. People brought nonperishable foods that were given as a "Roman tax." About two tons of food are donated annually to Pasco County food banks. Other churches in the community also had similar tax or "census" taking features that helped collect food donations. Children were invited to pet some of the animals, including a donkey and horses. They also could stop at a pottery shop and get a lesson in making pottery. "It's very hands-on and interactive," said church member Crystelle Miranda. "Everyone who lives in the city, works in the city, is in character. It hopefully gives them a true sense of the excitement of the city before the birth of Christ." At the end of the exhibit, visitors had the chance to meet church members and pray with them if desired. Inside the church, hot chocolate, cookies and candy canes were served. And there were opportunities for fellowship. Visitors came mainly from Pasco County but also Pinellas and Hillsborough counties. Miranda came to Experience Bethlehem some years ago and decided to join the church. "This is our major outreach," she said. "The whole experience is very moving." A bonus for church members is the camaraderie in building the city over several weeks. Side by side, painting buildings, volunteers "make buddies for a lifetime," Miranda said. In the seven years Smith has been pastor, about 15 families have joined the church after coming to Experience Bethlehem. One family joined the church and then the next year their child was the baby Jesus, Smith said. People "appreciate the opportunity for children to see the connections for why we celebrate and get away from Santa a little bit," he said. At First UMC, Orlando, students from the church's prekindergarten and elementary classes performed during "A Walk Through Bethlehem." The event, held Dec. 8 this year, has been a one-night tradition for 27 years. For 16 of those years, Holly Eby has been its coordinator. She also is the church's children's director. "It starts the Christmas season," Eby said. "It sort of brings it to life. There is something for everyone in this." Sheep, goats, donkeys and a miniature cow were among the live animals found at the stable. For most churches, those live animals play important roles in re-creating the feel of ancient times. They often come from specialty businesses that rent the more exotic animals, such as camels. But sometimes church members donate horses, goats or geese. Eby said planning at First UMC usually begins shortly after Labor Day each year. Fifty to 60 volunteers set up the Holy City. Teenagers from the church's youth program serve as coordinators for 16 scenes that tell the story of Jesus. They also watch after the younger children, who start as young as 3 in the chorus. Nearly 140 students participated this year. The program, supported by the church outreach budget, has proven to be a good opportunity to meet and greet people who might later join the congregation, Eby said. Hundreds of visitors come from Orlando and surrounding areas. Visitors to North Naples UMC's re-created town of Bethlehem had plenty to see at the annual event that grows every year. Photo from North Naples UMC. 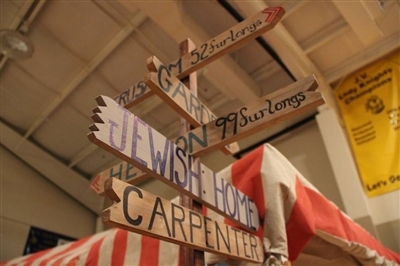 For five years, Spring of Life UMC has been staging "Night in Bethlehem," featuring shops, demonstrations of crafts of old, a tax collector and census-taker and a live manger scene. Coordinator Dawn Wolfe said the event attracts hundreds and is growing. Photo from Spring of Life. The approximately 20-minute walk through Bethlehem gave people a chance to see the whole story. "A lot of people have seen parts of the story but don't know how it connects," she said. For the children who participate year after year it can be a special experience as they graduate from one biblical scene to another and come to understand the whole story over time. "It's embedded in their hearts. They understand it one period at a time," Eby said. North Naples UMC has held "A Night in Bethlehem" for the past seven years. This year, on Dec. 6 and 7, church members expected to welcome as many as 2,000 people to enjoy a walk through the city, beginning with the marketplace. Visitors could explore a typical Jewish home of that period and stop to view biblical scenes that tell the story of Jesus. Musical groups performed hymns and traditional Christmas carols. This year, organizers added a camel station where children could feed the animal carrots. There also were demonstrations at several stops where people learned how bricks or necklaces were made, and children were invited to try their hand at the crafts. But there also was time for quiet reflection. A prayer tent was set up "if people feel led to pray," said AmySue Benker, who serves in the church's outreach ministry. "Everyone can enjoy it, from the littlest kid to older members of our community," Benker said. "It's a way to have fun, but you also can get something spiritual out of it." * Kathy Steele is a freelance writer based in the Tampa area.